Is it feedlot, grass-fed, or something in between? In recent years, there has been a broader choice in finished beef available to consumers. 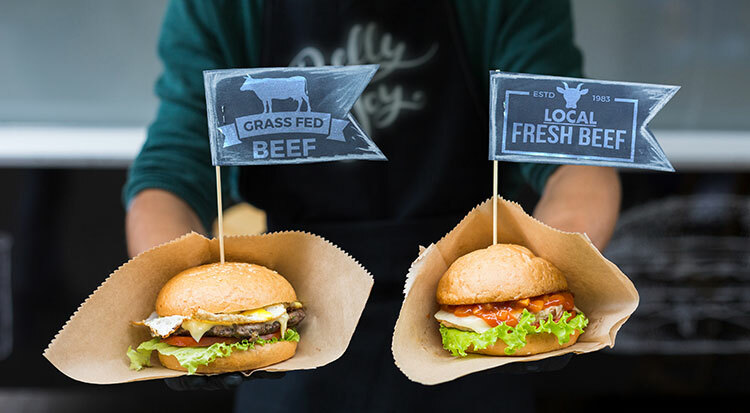 The supply of “grass-fed beef” has risen, and it always raises some controversy within the industry because it gives consumers a clear choice in the kind of production system the beef comes from. Some consumers simply don’t like the idea of feedlots, and whether we like it or not, they can vote with their food dollars. There are large population centers throughout the country where affluent consumers are looking for locally sourced foods. Meat is part of that . . . not just beef, but poultry, pork, lamb, and others are all experiencing expanded demand. The problem with grass-fed beef is that the production systems are quite variable, and that results in a great deal of variation in the product. This is much less the case with conventional feedlot beef. The variability from farm to farm in production systems of grass-fed beef works for small-scale direct sales, but it creates a situation where it is very difficult for a commercial meat purveyor to provide a consistent product to wholesale customers, driving many of them to source their grass-fed beef from other countries. Many of the consumers of grass-fed beef are also interested in local, small-scale production systems. These contradictory values lead to confusion in the marketplace and a lot of discussion about where beef comes from and how it is produced. In our North Carolina market, beef products available to consumers include conventional feedlot beef, “all natural” conventional feedlot beef, local feedlot beef, pasture-raised and finished beef, and grass-fed beef. For me, I love all beef, but there are clear differences in what I prefer. Our family raises our own beef using a pasture-based system with concentrates along the way to improve quality grade and to keep the animals younger at finish than would be possible for me with a 100 percent grass-fed program. I prefer that beef because it is what I am used to, but in general it seems to have more flavor and less fat trim than feedlot beef. Our target endpoint is at least Mid-Choice in quality grade. Several weeks ago, we held the fifth biennial “NC Choices Carolina Meat Conference” in Winston-Salem, N.C., and it is amazing to see how much the niche meat industry has developed in our region since we started. The conference targets a diverse audience including consumers, farmers, meat processors, chefs, governmental agencies, and allied industry. One thing that continues to come up is that there is no clear definition of “grass-fed beef,” and many farmers, consumers, processors, and chefs think that an animal born and raised locally on pastures for its entire life is “grass-fed.” Of course, that is not the case, and as I mentioned, we have a lot of producers who do some supplemental feeding, especially in the finishing stage. As you dig down and discuss the details of these production systems, most local beef customers are very accepting of a product that is produced using limited supplementation as long as it was produced and processed locally, stayed on pasture its entire life, and had the majority of its diet from forages. Many consumers and chefs say they don’t like grass-fed beef; this is probably because their early experiences with grass-fed were with animals that were not well finished. In our region, the base forages are bermudagrass in the sandy Coastal Plain and infected tall fescue in the Piedmont and mountains. Neither of these forages can produce the level of performance necessary for finishing an animal, so extensive use of specialty forages such as nontoxic fescue and annuals are needed for 100 percent grass-fed beef. Even with those forages, droughts and other production challenges make it hard to consistently produce a Choice product for delivery on a prearranged date. This is the reason that the pasture-raised and pasture-finished beef has been very popular in our area. Farmers can do their best to provide good-quality forages through using a good forage system and good grazing management, but they also have the flexibility to reach their desired endpoint in a timely way by using some supplementation. This makes it much easier to deal with the environmental fluctuations we see and also makes it easier for a wholesaler to provide a more consistent product from a producer network with variation in production systems. One topic at the conference that always leads to a lot of discussion is labeling requirements for niche meat products. If there are production claims on the label or marketing materials, such as “produced without growth promoting hormones” or “grass-fed,” then there has to be a paper trail so those claims can be substantiated. There are well-established labels that can be used such as “Animal Welfare Approved” or “American Grass-Fed” that require third-party certification, and those are encouraged when it makes sense for you. At the minimum, you need a written production protocol and a signed affidavit that you followed your established protocol in the production of your product. That approach has worked well for small independent producers. To that end, we recently published example production guidelines (protocols) for three distinct types of local beef products, including “Local Beef,” “Pasture-Raised and Pasture-Finished Beef,” and “Grass-Fed Beef.” Producers can either adopt one of these protocols, or they can download editable versions that can be custom fit to their production system. In recent years, we have done a number of studies with locally finished beef, and it is clear that there is a lot of fertile ground between the feedlot-beef product and grass-fed beef. Attributes such as the fatty acid content (omega-3 to omega-6 ratio, and conjugated linoleic acid or CLA) for pasture-raised beef (produced under the NC State guidelines) is more in line with 100 percent grass-fed as compared to feedlot beef. It is also important to note that the differences between grass-fed and feedlot beef are quite small in comparison to other meats (poultry and pork), regardless of the production system. As we move ahead with these alternative beef products, it is critical to keep several things in mind. First, most of our beef will continue to be produced in feedlots using a lot of modern technology. This is critical for the overall food supply as it allows us to be more efficient so it is more available for people without a high level of disposable income. There will also be good-quality grass-fed beef, both imported and that raised by producers who have developed a production system that results in “finished” animals at a reasonable age. Finally, we believe we will see a boost in the pasture-raised and pasture-finished products for all the reasons previously discussed. As niche meat systems continue to evolve, it is important that producers don’t disparage other production systems to try to get market share. We all need to be honest and transparent about how we produce our beef, and to understand both the advantages and disadvantages of all beef production systems. It is a lot more complex than just feedlot versus grass-fed. If you are considering adding a finishing enterprise, study your options carefully and develop a system that meets the demand of your customers and fits your production environment. This article appeared in the November 2017 issue of Hay & Forage Grower on pages 36 and 37.